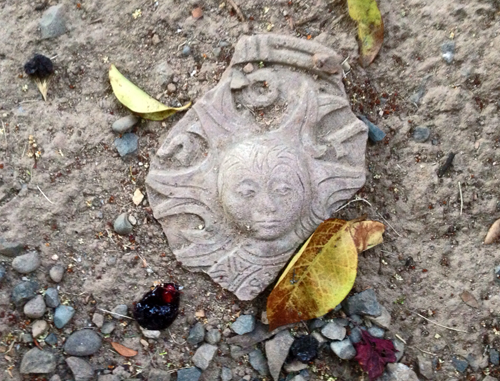 Last night at dusk I went out to turn off a backyard sprinkler and noticed a broken garden plaque that lay among fallen leaves and plums. It’s been there for quite some time, one of those objects I don’t know what to do with but like too much to throw away, so I leave it where it lies. Last night, in the twilight, I noticed it. The plaque was a primitive image of the sun – the word “SOL” is still visible. We got it in Mendocino a long time ago and hung it on the fence at a time when gardening was one of our major activities. Its importance waned under the time pressures that came with more “gainful” employment,” but this little artifact, like a Velveteen Rabbit made out of stone, can still speak when I stop to listen. After I snapped this photograph, I went looking for other such artifacts, both in a box of old pictures of mine and among vintage postcards, photos, and tintypes I’ve collected. If you are a packrat like me, you surround yourself with such things. Dreams change, and ambitions, just like our lives, can be fleeting. The artifacts often outlive them. 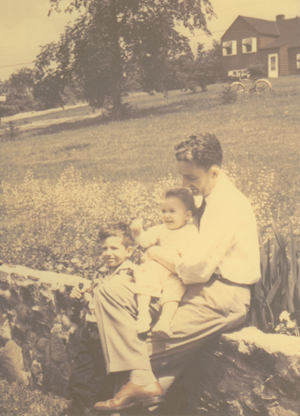 Nothing shows that more clearly than this picture of my father, my sister, and me by a stone wall I helped build. I’ve always liked this team photo, with its mix of bravado and shyness in front of the camera. 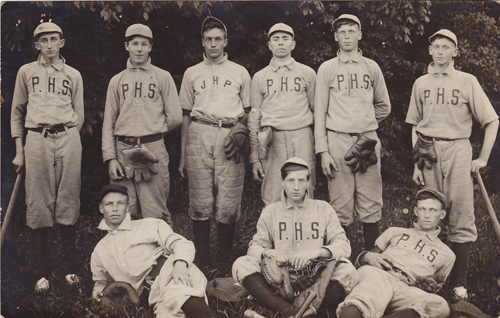 Did any of these boys of summer dream of playing in the majors? Did any of them come close? Did they love the game any less than the 2013 all stars who played in front of millions of viewers last week? I’m guessing that at the moment this picture was taken, they may have loved it more. 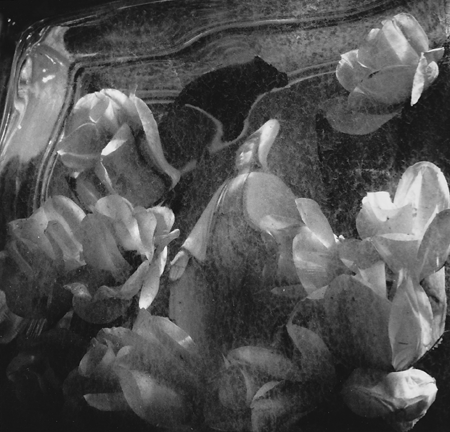 This is a poignant image, from a photo I took of an arrangement in a glass box, embedded in a gravestone in an old Italian cemetery in Binghamton, NY. Virgin Mary stands amid plastic roses, her image distorted by thick old glass. I spent a summer there working in a factory, and returned again and again to this cemetery, which was full of angels and lambs and redeemers, for don’t these all speak of a nearly universal ambition – the longing for redemption, in the here, the hereafter, or both? The world is alive and things within it can speak to us if we listen. And finally, one of my more important artifacts. 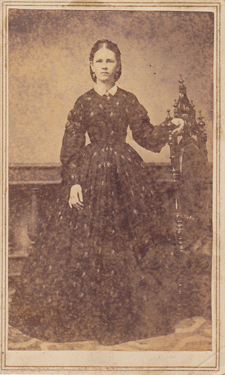 I kept this photo of a young 19th century woman over my desk while writing my first novel. This, I thought, was how the book’s heroine would have looked if she’d posed for a picture. So this photograph, taken more than a hundred years ago, of a woman whose dreams I cannot begin to fathom, became an icon for one of my own ambitions. I didn’t tell her story very well, but as the character in So Cold the River observes, that often doesn’t matter. Sometimes when I look at this picture now, it holds a greater mystery than it ever did when I used it as a writer’s prompt. Now I can see its own inscrutable mystery. Artifacts of our ambitions are things we notice as the eyes of soul begin to open. This entry was posted in Family, Imagination, Photography and tagged family, imagination, photography, soul making. Bookmark the permalink. I find it happens with the community of bloggers I follow. No doubt the inspiration would have been greater in some of the legendary groups, like Tolkien and the Inklings, but it’s still very neat when i read my regular followed blogs and get fresh ideas. And thanks! It’s always nice to wander around in your thoughts for a little while. Thanks. Koryta’s phrase, “artifacts of their ambition,” is one that has been rattling around for some time – I’m surprised I haven’t written about it before this. I doubt that one post is the end of it either. A find post, Morgan; pleased to have been allowed to share your cabinet of mementos and inspirational artefacts. I never thought about writing of it before that twilight evening, when I saw the broken plaque. Koryta’s popped to mind, and the post was one of those that wrote itself.